Submitted 1 year 3 months ago by black_guns. 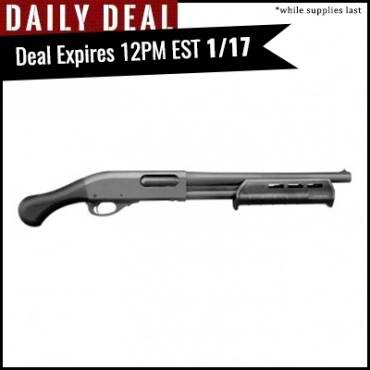 The Remington 870 Tac-14 12 gauge shotgun offers a home-defense weapon in a smaller size, featuring a 14" barrel and reaching just over 2 feet long in overall length. The Tac-14 delivers devastating, threat-stopping power to protect your home and family. Built with the notable reliability of the Remington 870, a Raptor pistol grip, and a Magpul M-Lok forend, this shotgun provides powerful personal protection.